Rebellion has brought forth a veritable chef d’œuvre. The mystery setting is a technique developed by Van Cleef & Arpels for mounting precious stones without any of the setting claws showing. All trace of metal completely disappears from view and we are left with just the jewels. Thus one has the impression that the stones are free, their glare is magnified and they shimmer like cat’s eyes. 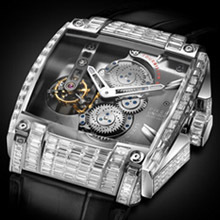 In order to apply this jeweller’s technique to the REB-5 Tourbillon, the watch case had to be rebuilt to allow for the “invisible” setting of the stones, which were cut with extreme precision and set using minimum tolerance levels. And to ensure all traces of the diamond settings were well and truly hidden the setters worked under microscopes, very much like micro-surgeons. Together Rebellion and the setting workshop Bunter SA have succeeded in creating a REB-5 Tourbillon with diamonds set totally invisibly. Rebellion and Bunter worked with the very best craftsmen and specialists, who developed and managed the most state-of-the art technology in order to explore new methods and to take this fantasy to its natural conclusion and beyond. The settings are hidden from view as if by magic, the diamonds sparkling brilliantly without the slightest sign of a fastener in sight. They were cut in such a way as to leave no clue whatsoever that an attachment system is even being used. The Tourbillon Diamond symbolizes perfectly the fusion between jewellery and horology: a tourbillon movement and baguette diamonds. There are 307 diamonds making up the case (24.05ct) and another 12 diamonds in the crown (1.02ct); each precious stone is individually shaped according to its specific position; all diamonds are Top Wesselton quality and IF to VVS clarity. As for the time it took to develop, we are talking about just under 1,000 man hours: design, research and development, the programming of the machines and tools, cutting of the diamonds, visual inspection of each part, setting, assembly and adjustment. These are the many links in the chain of command which culminated in this breathtaking achievement. 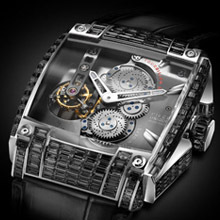 Rebellion has gone for a watch, the REB-5 Tourbillon, with a mechanical tourbillion movement, a seven-day power reserve and a case in white gold with a total of 319 baguette diamonds (25.07 carats). The Full Diamond and the Black Diamond are submerged beneath their precious stones, yet this same blinding light is fully respectful of the original concept and aesthetic of the REB-5 Tourbillon. The bold lines which characterize the design of the REB-5 Tourbillon are not exactly what one expects to find on a diamond-studded watch, still less one with invisible settings. This was a challenge that was taken up thanks to the creativity, ingenuity, know-how and a touch of madness on the part of its creators. They had a dream and they fulfilled it.